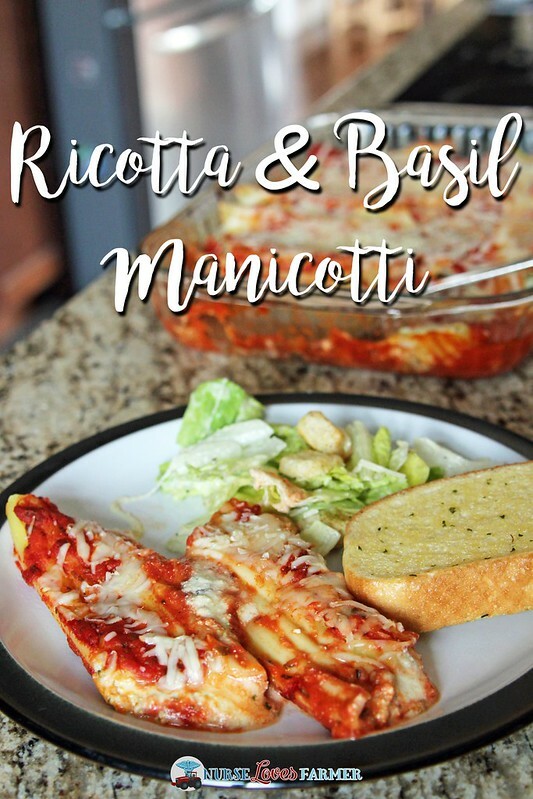 I’ve been cooking up a storm lately and have wanted to share a lot of my favourite recipes, such as this delicious ricotta and basil stuffed manicotti. Actually, it has lots of delicious mozzarella cheese in there too, but I didn’t want my title to be ridiculously long! Cook pasta per directions on the box, be careful not to overcook or they will fall apart! While the pasta is cooking, make your filling by combining 3 cups of mozza cheese, 2 cups of ricotta cheese and the basil. *If you use fresh basil, add the egg to make your mixture more moist so it will bind nicely. I find with the tube of basil, you will have enough moisture, but feel free to add the egg if you want to! Once the pasta is cooked, drain it in a strainer and run cold water over pasta to cool it down and then cover the bottom of a 9×13″ pan with the pasta sauce, just enough to cover. The easiest way to stuff the manicotti pasta is to put all of your cheese and basil mixture into a large Ziploc bag and cut a small piece of the corner off the bottom of the bag, thus making your own disposable piping bag. 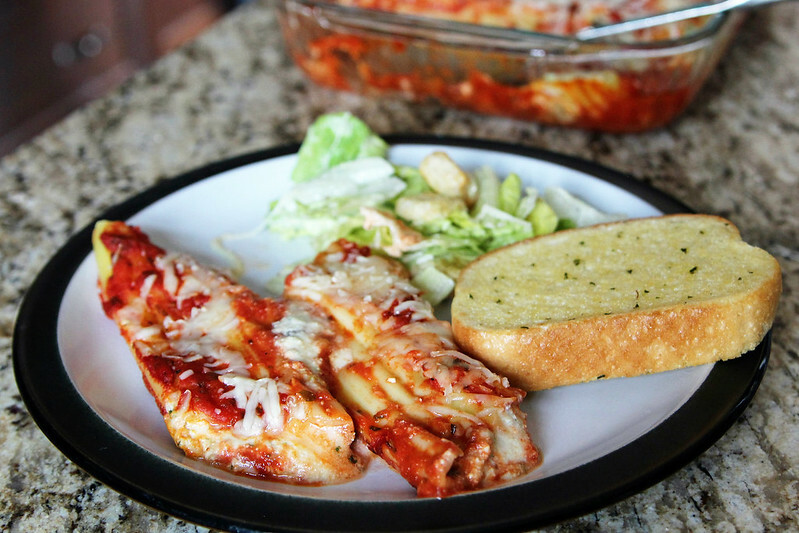 It may take a bit of practice, but fill up each manicotti with cheese and basil mixture and place into 9×13″ tray on top of pasta sauce. 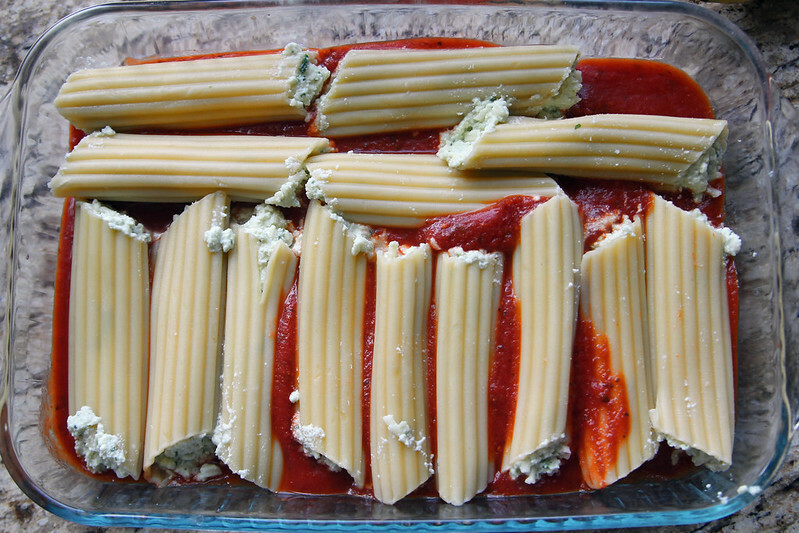 Cover the pasta with the remaining sauce from the jar and top with remaining 1 cup of shredded mozza cheese. It can now be covered and stored in the fridge until you’re ready to cook, or you can cook it now by placing it in a 350ºF preheated oven for 15 minutes. Then, remove from oven, top with parmesan cheese, and return to oven for another 10 minutes until cheese is melted and sauce is bubbling. Cook pasta per directions on the box, be careful not to overcook or they will fall apart! 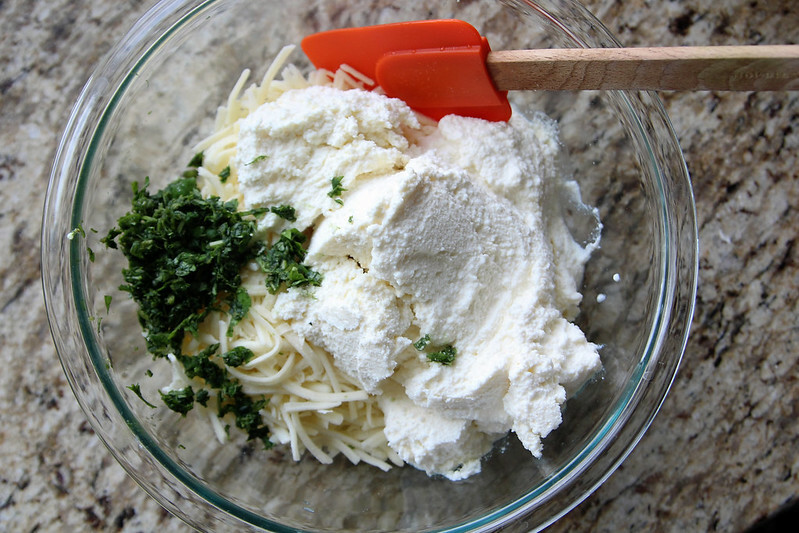 While the pasta is cooking, make your filling by combining 3 cups of mozza cheese, 2 cups of ricotta cheese and the basil. *If you use fresh basil, add the egg to make your mixture more moist so it will bind nicely. I find with the tube of basil, you will have enough moisture, but feel free to add the egg if you want to! Once the pasta is cooked, drain it in a strainer and run cold water over pasta to cool it down. Cover the bottom of a 9x13" pan with the pasta sauce, just enough to cover. 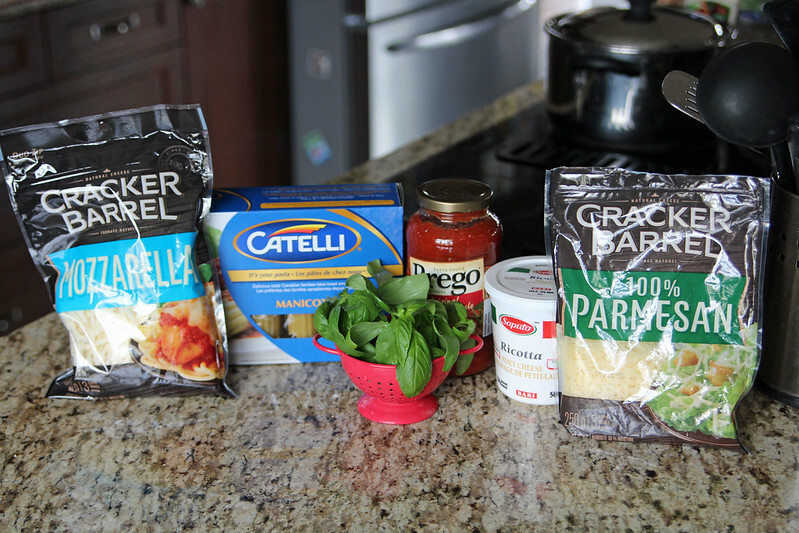 Time to stuff the manicotti pasta! 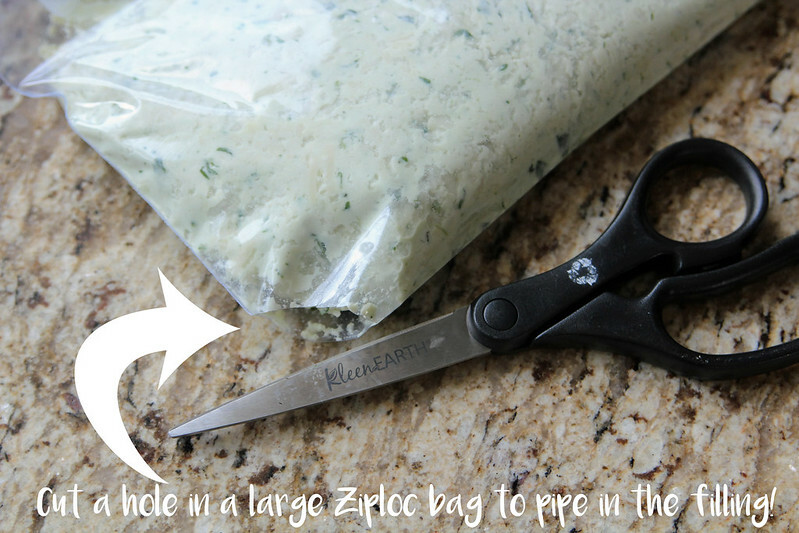 One trick I like to use is to put all of your cheese and basil mixture into a large Ziploc bag and cut a small piece of the corner off the bottom of the bag, thus making your own disposable piping bag. 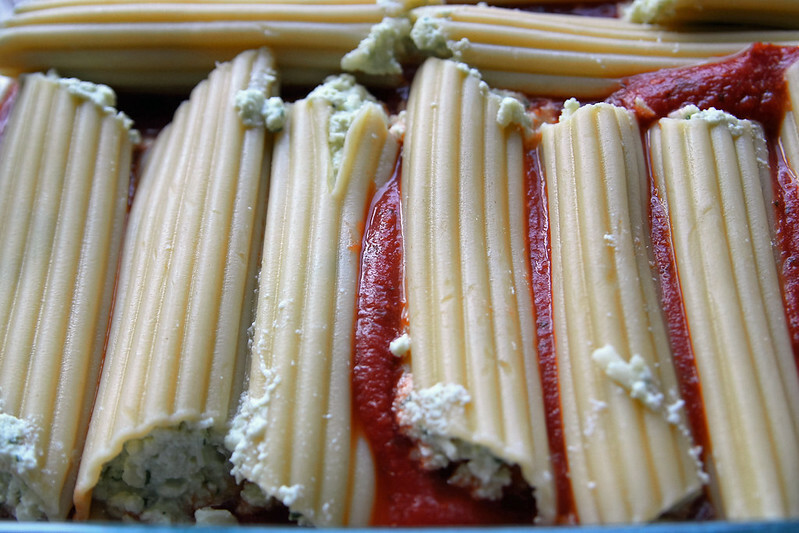 It may take a bit of practice, but fill up each manicotti with cheese and basil mixture and place into 9x13" tray on top of pasta sauce. Cook it now by placing it in a 350ºF preheated oven for 15 minutes. Then, remove from oven, top with parmesan cheese, and return to oven for another 10 minutes until cheese is melted and sauce is bubbling. Again, I apologize for less-than-stellar and even less-than-appetizing photos, but when you’re cooking for a hungry farming crew, sometimes you don’t get ideal lighting and the opportunity to plate food very nicely! Also, there are NEVER any leftovers so taking photos the next day isn’t an option. Just trust me on this one — it’s amazingly delicious and give it a try! I honestly don’t know, I’m not a nutritionist.